Building a Snow cave: Camping in snow is one thing, but there is no comparison between the calm, quiet, warm snow cave and loudly flapping tent, buffeted by gale force winds. This sort of protection is not quick to build; taking 2 or 3 hours, but it affords great protection in a storm. 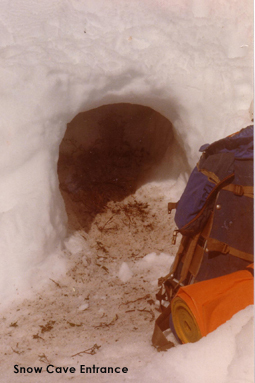 If you do a lot of winter walking, building a snow cave should form part of your survival repertoire, although you should also read “Snow Caves Can Kill“. Snow caves cannot really be dug by hand, you simply can’t move the volume of snow required to build a quality snow cave (not some so-called emergency hole). The task is still a big one with the aid of a snow shovel and you need to be careful not to work up too much of a sweat. 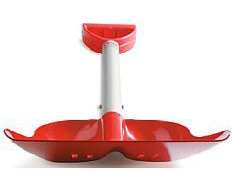 If you are travelling as part of a group in winter conditions, a telescopic shovel as part of group equipment is well worth the extra weight. If you don’t have a shovel you could improvise by using a plate or some other utensil. It will likely take you twice as long so don’t engage unless you have required time and energy. Firstly, firm compacted snow is necessary around 2 metres (six feet) deep, and against a steep slope where snowdrift has built up. 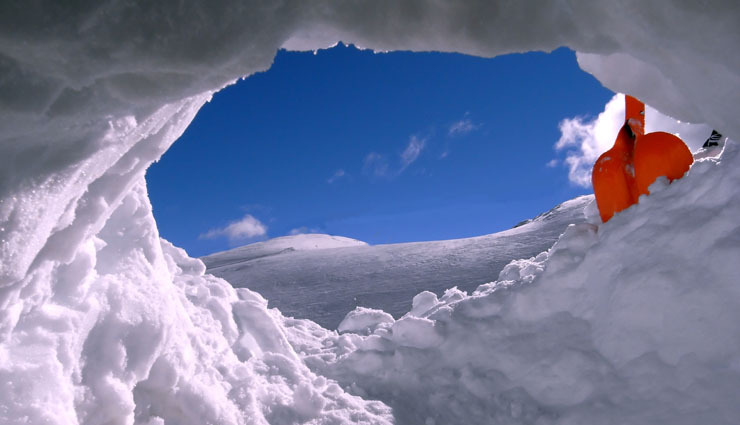 Do not set up a snow cave in avalanche prone areas or around trees! Dig out an entry point into the slope, deep enough to begin a tunnel. Then continue to dig inwards about a metre (3 feet) or so to form the entrance arch, then dig upwards to create your living area, large enough for your party. 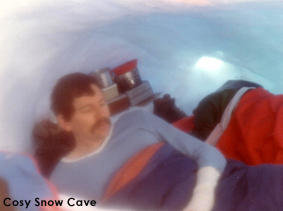 The area for sleeping should be above the top of the entry tunnel, as this traps the warm air inside the snow cave. Once you have dug out the cave, smooth off all upper surfaces with your gloved hand or a piece of plastic, making sure it all surfaces are concave. This ensures that melting snow will run down the walls and not drip on the occupants. 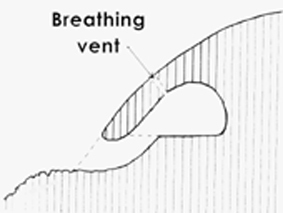 Remember to put in a vent hole to the outside world to avoid being asphyxiated. If it gets too hot, make the hole bigger! Put your skis, shovel or other equipment on top of the cave so people don’t walk over, risking the collapse of your home. 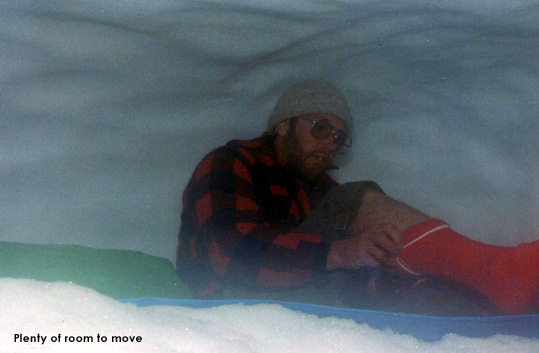 Building a snow cave can be tiring work. 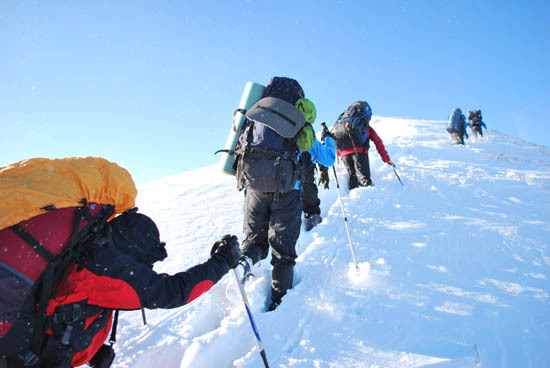 Keep fluids up as you are likely to perspire heavily, and adjust layers of clothing so you don’t become saturated. If you have a large party, two teams can work on building a snow cave at the same time. Instead of creating one entrance, each team begins an entrance (2-4 metres apart) and then upwards as per previous instruction. Once the upward digging to create the air lock is complete, then each team digs sideways until they meet. One of the entrances can now be blocked off with snow, and a door made for the entrance with pack. Using this approach can halve the time to build a snow cave and keeps everyone occupied.